Readers relate what they read to personal experiences (text-to-self), to information from other text (text-to-text), and to information about the world (text-to-world) in order to enhance understanding of self, text, and life. 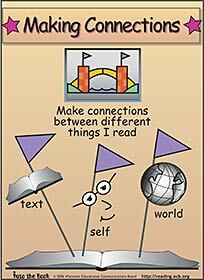 Make connections between different things I read. For this activity, students move an avatar through a 3D landscape as they attempt to "climb" the Mountain of Understanding. 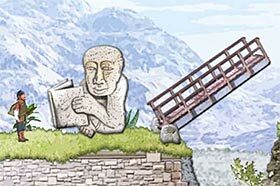 Each time they come to a chasm, a stone guardian offers to help them across if they can make a connection that will help him understand what he is reading. They must choose a sentence from their bag of connections; if it is a meaningful connection that helps the guardian understand, he bridges a chasm to let them continue. In level two, students are instructed whether to choose a text-to-self, text-to-text, or text-to world connections. In level three, students must type their own connections. Students attempt to clear the smog from a city by leaping between buildings—but the length of their jump depends on making a strong connection. In order to slingshot the character to another building, the player must choose connections that help them understand the anchor text, a student essay. Choosing a strong connection makes their slingshot strong and sends them far; a weak connection only propels them a short distance, and a distracting one takes them nowhere. In this episode, Mrs. Pingel teaches students how to make text-to-self, text-to-text, and text-to-world connections using a newspaper article. During self-selected reading, Julia goes into their book "Solo Girl," where she is able to help a character named Cass by making connections. Later the strategy is useful in her karate class.